I finished Lily’s boned bodice and a line skirt dress and she likes it! This is the finished result and part three of my process of creating a pattern from scratch. 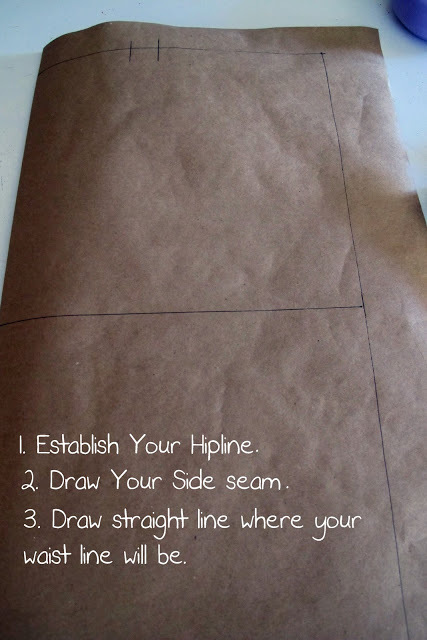 In part one I draped the bodice to the dress form and created a paper pattern. In part two I cut it out of fabric and draped it to Lily’s body. It needed a lot of adjustments so I made a new pattern for her based on those and a new muslin. Which is actually the lining for the top of this little dotted chambray dress. The skirt is unlined. Once I got the top part to fit well, I drafted a simple A line skirt from the flat pattern method. 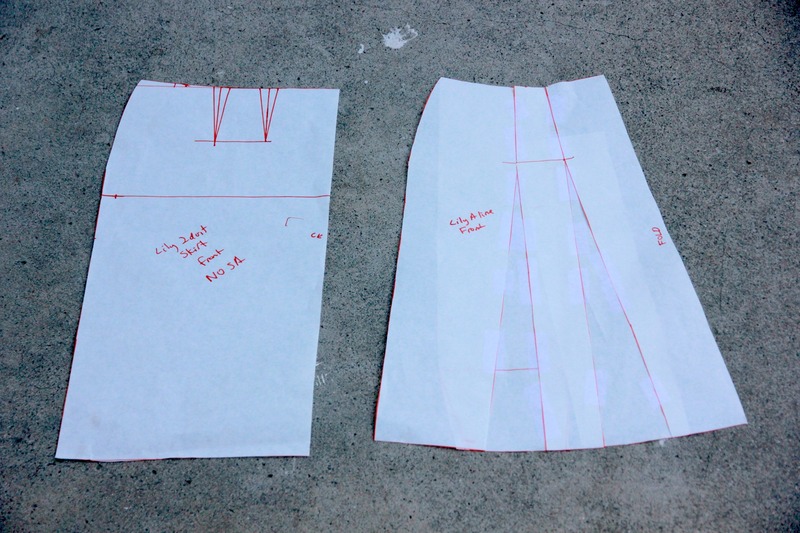 Drafting an A line skirt or a straight skirt are among the easiest patterns to draft. You can be done with both patterns in less than an hour. Even on your first time. 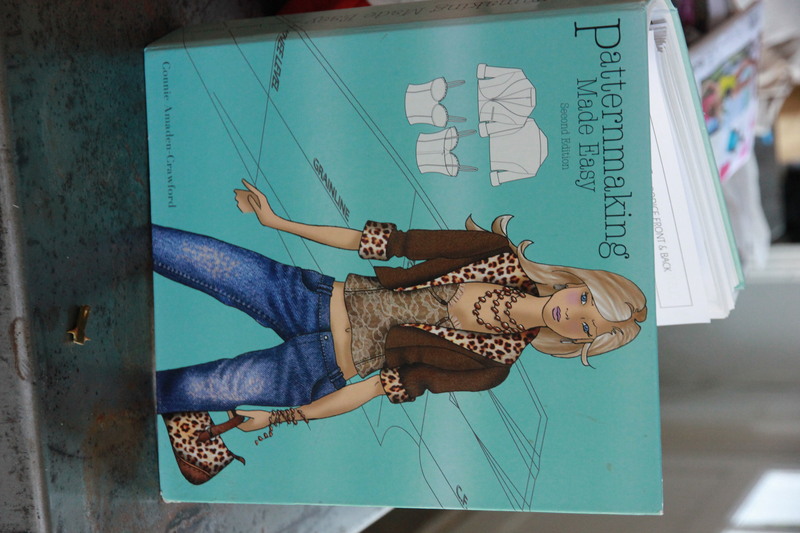 I would recommend buying a good pattern drafting book like Pattern Making made Easy by Connie Crawford . If you can go through all the trials of fitting a commercial pattern you might as well try drafting your own. Fitting can actually be harder than drafting from scratch. Kind of like doing alterations can be harder than actually just sewing something. Above is the straight skirt I drew based on Lily’s measurements. Then I traced the straight skirt, cut out the darts, drew a straight line down from the center of the dart. I cut straight up the line and then pivoted the darts closed. The closed darts create the flare for the a line skirt. 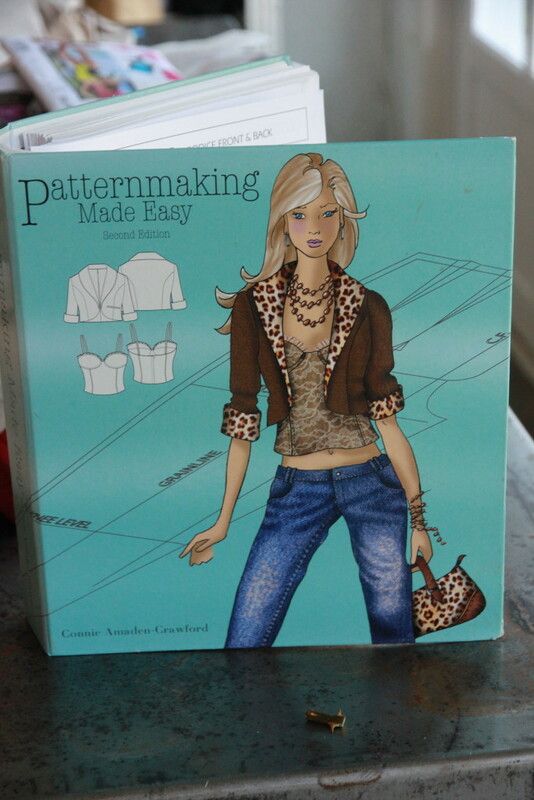 All the directions for the process are detailed in the book. Common measurements for all the sizes are already in the book but you can use your own custom ones too. 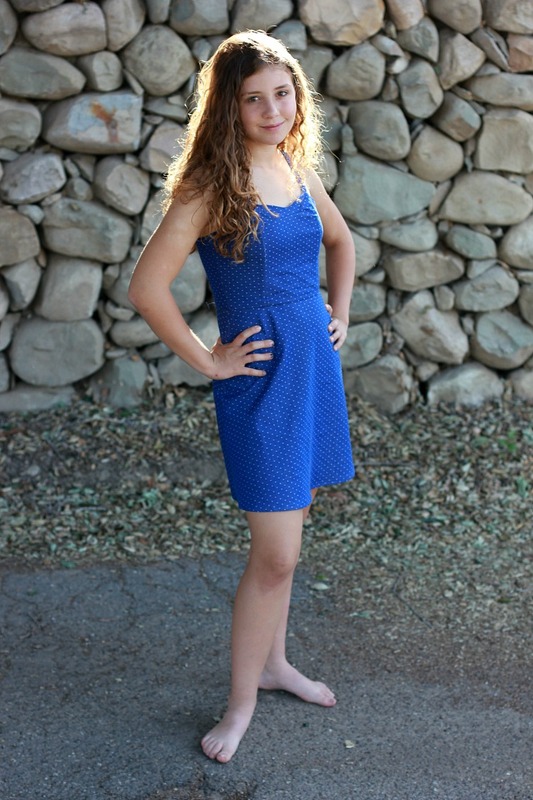 Lily’s measurements of 25.5 waist and 35 hip put her in the petite size 5 .Go by hip measurements, not waist. I did have to add an inch and a half to the pattern 3/8 inch at each half pattern waist) since the petite size five is based on a 24 inch waist. I added the straps to the dress for added security and because it just looks cuter on a young girl then strapless IMO. But the boning inside gives nice support without being too uncomfortable. The straps don’t hold it up. There are only 6 pieces of lightweight boning sewn in the seams but it’s all that’s needed for smaller frames. I know in my last post I said this was going to be a lace dress. But the dance came and went and I decided this fabric would get worn more. I was worried because I just made it without asking if she liked the fabric first, but I was lucky since she does. You never know with kids and mine like to pick the fabric but once in awhile I go out on a limb and just want to see how something will look so I take the risk that they won’t like it. I squeezed this dress out of one yard of fabric. I wanted to make a circle skirt and made the pattern for it, but it wouldn’t fit on the fabric. So I used the A line pattern instead. It still has cute side flare. I couldn’t find my invisible zipper foot so used my normal one. It’s not perfect . I hate sewing invisible zips. I can never get them to be invisible! Tell your daughter she looks so pretty in that dress and you my dear are very talented to be able to make the entire dress from scratch. Hi, David was here and wanted to know how Lily had grown up, so your post was perfect. He couldn’t believe how grown up she is. Tell her hi. 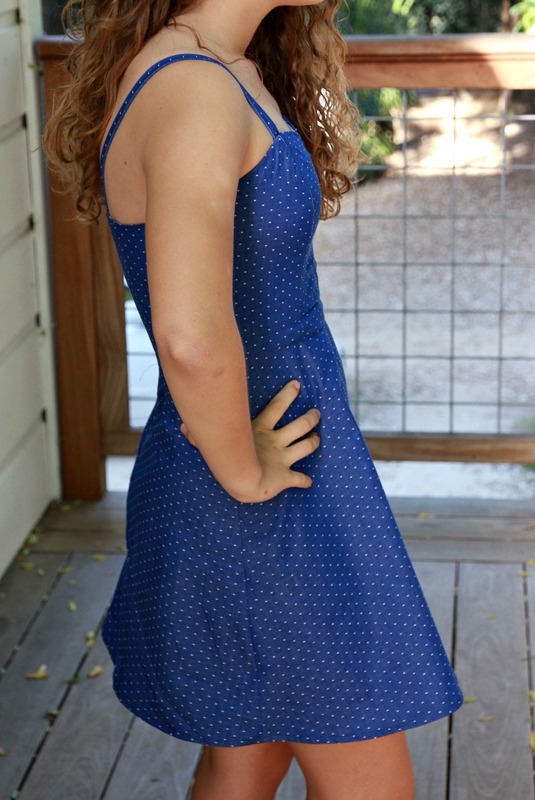 Lovely dress and lovelier girl.